Location: The east side of Malajon Island, called Black Island because of its black rocks. The wreck is just off the beach in front of a stranded vessel on the shore. Access: By banca 3-5hr west to the west side of Busuanga Island. If you are going to dive on other wrecks en route, you can stay overnight at the little resort of Las Hamacas resort. Conditions: Normally calm with little current, but this area, out in the South China Sea, does not have protec­tion like Coron Bay, so conditions can get rough with fierce currents, You would not normally make this jour­ney in bad conditions, Visibility can reach 20m (65ft). The origin of this 45m (150ft) coastal vessel is not known. It sits upright but down the sandy slope from the shore, with the bow bottoming at 32m (104ft) and the stern bottoming at 20m (65ft). Relatively shallow, this dive is great for wreck-diving novices, photographers and night divers,and has plenty of fish, There are many large scorpionfish and lionfish on the superstructure, small shoals of batfish, large shoals of sweepers, snappers, fusiliers and groupers, trumpetfish, Six-banded Angelfish and Emperor Angelfish. The hull has lots of sponges and hydro ids. There are crinoids, although not in the numbers seen elsewhere in the Philippines, The western side of Malajon Island has poor corals but at times of strong currents is good for sighting large pelagic species, including Hammerhead Sharks. Location: South of Concepcion village on Busuanga Island, on the outer edge of the Lusteveco Company Pearl Farm. This wreck no longer breaks the surface. Access: 21/2hr by banca west until south of Concepcion village, on the edge of the buoys of the pearl farm. An auxiliary oil tanker of the Imperial Japanese Navy Combined Fleet in World War II, this wreck, 168m (550ft) lorlg, 10,045 gross tons, was sunk on 9 October 1944 by US aircraft. Some recent research suggests it may be the Okikawa Maru. In any case it sits almost level, with a slight list to port, pointing 3300 (compass bearing), with the bow broken off in 26m (75ft) of water. The main deck is at 16m (52ft). A good wreck for penetration and wreck-diving courses, it has everything, including good corals (very large lettuce corals), sponges and shoals of fish such as fusiliers, snappers and batfish, plus the ubiquitous lionfish and scorpionfish. 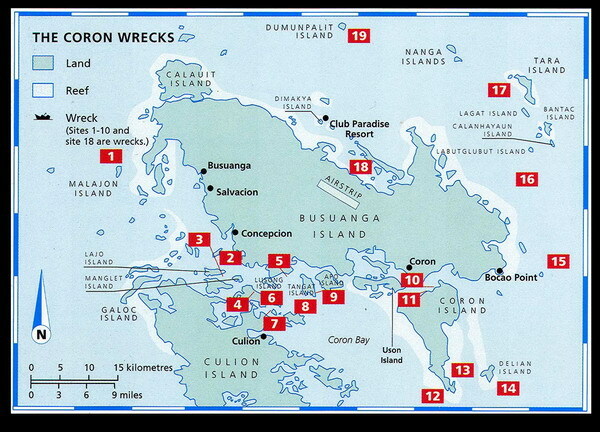 One of the few true warships among the Coron wrecks (the others were mostly auxiliary vessels), the Akitsushima, sunk on 24 September 1944 by US aircraft, was a flying boat tender, The wreck (148m [487ft] long, 4650 gross tons) lies on its port side pointing 2900 (com­pass bearing) in 38m (125ft) of water, with the starboard side hullat 20m (65ft). The arm of the stern crane used to load and unload the flying boat lies broken to port in 34m (112ft). The main deck is split between this crane and the funnel. There is no sign of the flying boat. Location: The southern end of Lusong Island. Access: 2hr west by banca. The stern breaks the surface at low tide. A shallow wreck, lying from the surface to 10m (33ft), this is equally good for snorkelling and wreck photogra­phy, and is often used as a relaxation between main dives. The wreck has been salvaged, and all the top has gone. It is nicely covered with sponges and soft corals, and has many Copperband Butterflyfish, Six-banded Angelfish, pufferfish of all sizes, batfish and various sea cucumbers. The lack of crinoids and sea stars is perhaps surprising. There is also good snorkelling on the reef beside the wreck. Location: Between the northern end of Lusong Island and Tangat Island. Access: 2 h r west by banca. Conditions: Normally calm with some current, even in a heavy rainstorm, which I could hear while deep in the wreck. Visibility 10m (33ft) to 20m (65ft). This Japanese freighter - 137m (450ft) long, 5617 gross tons - was sunk by US aircraft on 24 September 1944. It lies on its starboard side pointing 0500 (compass bearing) in 25m (80ft) of water. The port-side hull is at a shallow­er 12m (40ft). This is a pretty dive. The port-side hull has many large lettuce corals, hydroids, black corals, brown finger sponges with Alabaster Sea Cucumbers wrapped around them, white sponges and sea anemones with clownfish. The fish life includes shoals of small fusiliers, batfish, large groupers, Golden Rabbitfish, damselfish and pairs of Whitecheek Monocle Bream. Be careful when pene­trating the wreck: scorpionfish hide all over it. Location: East of the southeast corner of Lusong Island, south of Site 5. Access: 2hr west by banca. Conditions: Normally calm with some current. Visibility 10m (33ft) to 20m (65ft). A Japanese freighter sunk on 24 September 1944 by US aircraft, this wreck - 158m (520ft) long, 6352 gross tons - lies on its starboard side pointing 2300 (compass bear­ing) in 34m (110ft) of water. The port-side hull is at 22m (72ft). This is a very similar dive to that at Site 5, but deeper, giving you less time to explore the wreck and less light for photography. Location: Southeast of Lusong island. The Iraka is a Japanese refrigerated provision ship, sunk on 24 September 1944 by US aircraft; 147m (482ft) long, 9570 gross tons, the wreck is almost upright, listing about 100 to port in 42m (138ft) of water pointing 2600 (compass bearing). The main deck is at 34m (112ft). Penetration represents an advanced dive due to the depth, but the superstructure is interesting, with soft corals and sponges. Large groupers hover inside the wreck, while lionfish, shoals of barracuda and batfish are outside it. Location: West of the southwest end of Tangat Island. Access: 13/4hr west by banca. Conditions: Normally calm, with light currents that can be strong at spring tides. When I was there conditions stayed calm after a rainstorm. Visibility 8m (25ft) to 15m (50ft). Yet another Japanese freighter sunk on 24 September 1944 by US aircraft. Some 137m (450ft) long, 5617 gross tons, the wreck lies on its starboard side in 25m (80ft) of water. The port side hull is at 12m (40ft). It provides a good introduction to wreck diving for novices. There are several large pufferfish, lots of large lionfish and scorpionfish, Bumphead Parrotfish, shoals of batfish, snappers and sweepers, Six-banded Angelfish, Golden Rabbitfish, damselfish and pairs of Whitecheek Monocle Bream and lots of sponges. In good visibility this would be a good wreck for photographers. Location: Close to the southwest side of Tangat Island. Access: 1112hr west by banca. Conditions: Shallow calm water. Visibility 8m (25ft) to 15m (50ft). Believed to be either a tugboat or an anti-submarine craft, this was sunk on 24 September 1944 by US air­craft; 40m (130ft) long, 500 gross tons, it lies listing to starboard down a sandy slope, with the stern at 22m (72ft) and the top of the bow at 3m (10ft), pointing 320' (compass bearing). This small wreck looks as though it has seen some recent salvage work. The water is mostly shallow enough for snorkellers, good for novices and photographers and for relaxation between dives. There are no corals on the wreck, but there are large lettuce corals beside it. There are angelfish, butterflyfish ­particularly Copperband Butterflyfish - and white sponges. Crinoids and sea stars are conspicuous by their absence. Location: A few hundred metres southwest of the entrance cove to the freshwater Barracuda Lake which is midway between Limaa Point and Balolo Poi~t on the northwest face of Coron Island. Access: 45min south-southeast by banca. Conditions: Shallow and calm with almost no current. Visibility 10m (33ft) to 25m (80ft). There are several dive/snorkel sites here, with a beautiful background of limestone rock formations, and sandy coves for picnics and sunbathing between dives. Most of the sites are shallow coral gardens, one around a limestone pinnacle which rises several metres above the water. Against the point are the remaining ribs and part of the hull of an oldwooden boat, 35m (115ft) long, that go down to 12m (40ft). This is an ideal site for photography, the wreck itself being inhabited by sponges, sea stars, butterflyfish, shoals of fry and shoals of immature barracuda. It is perfect for novices' first dives and also good for night dives. Location: 30m (100ft) inland from the centre of the northwest face of Coron Island. Access: 45min south-southeast by banca to a cove of lime­stone cliffs midway between Limaa Point and Balolo Point on the northwest face of Coron Island. In the centre of the cove the cliffs have a gap at sea level. You climb through this gap for 3m (10ft), turn right and climb easily up lime­stone pinnacles for 8m (25ft), traverse to the right 4m (13ft), then turn left and descend, continuing across two small channels to the entrance to the lake. The rock is sharp, so you will need to wear bootees or sandals. Conditions: Calm lake, sheltered on all sides. Visibility varies with the mixing of hot and cold water, being 30m (100ft) near the surface but hazy where the water mixes. This is a unique dive. The turquoise freshwater lake, sur­rounded by spectacular limestone pinnacles, is served by a hot spring. As you move out from the walls and descend, the water gets hotter and hotter. At 30m (100ft) my ther­mometer read 40°C (105°F) and deeper down would have gone even higher. There is little to see in the very hot water, but when you get back to the walls of the lake, a lone habituated barracuda, nearly 1 m (40in) long, will be waiting to be hand-fed. There is obviously interaction between fresh and salt water around the seaward side, as you can find sea­water species there. As well as the barracuda there are a small shoal of Golden Rabbitfish, some snappers, catfish, several species of shrimp and shellfish. In 1990, while filming in the lake, Brian Homan and his search company, ASR, found a neolithic campsite, complete with jade axe-heads, at 5m (16ft), and a further site on the upper slope that may be 5000 years old. Location: A few hundred metres northwest of Calis Point, the south point of Coron Island. Access: 2hr south by banca. Conditions: Calm water, by the cliffs and coves at the southwest end of Coron Island. Visibility up to 25m (80ft). You first enter a beautiful shallow coral garden at 4m (13ft), then go over the drop-off to 40m (130ft) plus. The shallow reef-top is covered with stony, leathery and soft corals, including very large Acropora table corals and some small gorgonians. There are plenty of small reef fish, Linckia sea stars (blue and grey) and anemones with clownfish. Over the drop-off are more table corals, some fire corals, stinging hydroids, Dendronephthya soft tree corals, whip corals and many small gorgonian sea fans. Location: Gunter, of Discovery Divers, prefers to keep this secret, but his banca crews know where it is and will soon pass the information on. The entrance is north-northeast of Calis Point on Coron Island, where several undercut limestone cliffs lead to small caves and keyholes. Having found the large cave entrance, the secret is finding a narrow channel in the floor that leads to the Cathedral cavern. Access: 2hr south by banca to just northeast of Calis Point. This is another unique dive I You swim to a large cavern entrance, over coral-encrusted fallen rocks. The bottom of this main entrance is at 7m (23ft) to 8m (26ft). You then descend an apparently dead-end narrow cleft in the floor of this cavern, find a tunnel at the bottom, continue, through this, admiring the many Spiny Lobsters and cowrie shells, and continue towards a gleam of light ahead. You come out at the bottom of a chamber some 20m (65ft) high and slightly narrower in width. This 'Cathedral' is beautiful, particularly when shafts of sunlight descend vertically through the water from a large hole in the roof where a large tree grew until it broke through and fell into the chamber. The chamber itself is about one-third full of water, so you can rise to the surface and chat to each other in air. Finding your way out again can become difficult if the sediment at the bottom of the chamber is stirred up. Location: Delian Island, 5km (3 miles) east-northeast of Calis Point on Coron Island. Conditions: You would come here only in calm condi­tions. Visibility can reach 25m (80ft). The north and south ends of this island give good snorkelling or shallow diving over coral gardens with many small reef fish and shoals of immature fish. Location: 19km (12 miles) east of Bocao Point, the southeast extremity of Busuanga Island. Access: 21/2hr east by banca. This is a sunken bank in 5m (16ft) of water so it can be rather difficult to find without either a local boatman or GPS (Global Positioning System). Conditions: You would make this journey only in calm conditions and would expect strong currents. Visibility can reach 30m (100ft). The site begins with a gentle slope of corals to 25m (80ft), where it becomes sand sloping out to infinity. The corals are not too good. This is a dive for when the currents are running and large pelagic species come in to feed. Sharks, tuna, Rainbow Runners and trevallies are common. 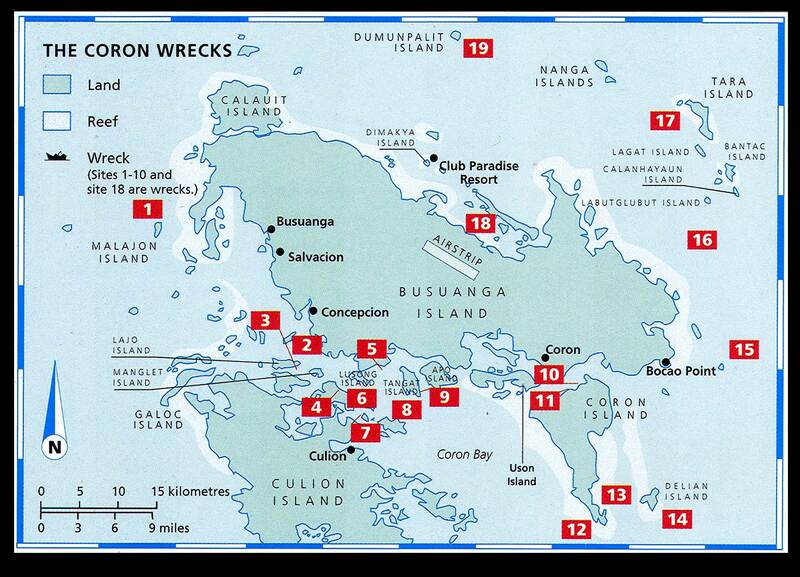 Location: Two brown rocks 50m (163ft) high, 2km (11/4miles) south of Bantac, Calanhayaun and Lubutglubut Islands, 37km (23 miles) southeast of Coconogon Point, which is the northeast point of Busuanga Island. Access: 3hr journey by banca around the east coast of Busuanga Island. Conditions: You would make this journey only in calm conditions. Visibility can reach 25m (80ft). The best diving is on the west, south and east sides of the southern rock, and the best snorkelling on the west side. With coral gardens sloping down to 25m (80ft), the area is a breeding ground for Cuttlefish. There are lots of reef fish and occasionally Hammerhead Sharks. Location: Opposite the village on the west side of Tara Island, 7km (41/2 miles) southeast of the Nanga Islands, 29km (18 miles) northeast of Coconogon Point, the northeast extremity of Busuanga Island. .
Access: 4-5hr in an overnight trip by banca around the east side of Busuanga Island. Conditions: You would make this journey only in calm conditions. Currents are normally light. Visibility can reach 25m (80ft). The corals have been heavily blast-fished, but despite the light currents, pelagic fish are common, including jacks, tuna, trevallies and Spanish Mackerel. Whitetip Reef Sharks are common and Guitar Sharks can be found on the sand. The island houses a Vietnamese refugee camp. Location: Close to the Club Paradise Resort, which is located on Dimakya Island (also known as Eric's Island after its owner). Access: By banca from Club Paradise or overnight from Coron Town around the east coast of Busuanga Island to its north coast, southwest of Coconogon Point. A Japanese freighter sunk on 24 September 1944 by US aircraft, the ship (152m [500ft] long, 6492 gross tons) sits almost upright with a 15° list to starboard, pointing 160° (compass bearing) in 43m (131ft) of water. The main deck slopes from 22m (72ft) to 28m (92ft). The wreck is almost intact and easily penetrated, with cars and trucks in the holds. An excellent dive. This site is also known as the Dimalanta Wreck, as it lies close to and in the shelter of Dimalanta Island. Location: The southwest side of Dumunpalit Island, 45km (28 miles) north of Port Carlton. Access: 5-6hr (in calm conditions) by banca around Busuanga Island. Conditions: Relatively sheltered. Can be dived all year round if the sea conditions allow boats to reach it. Visibility averages 20m (65ft). With a gentle slope from the shore to 25m (80ft), the site is unusual in the area for having pink soft corals. At 25m (80ft) the slope becomes sand with intermittent coral heads, among which groupers and snappers are common. Visiting pelagic species are found on the slope. The little dirt airstrip on the Yulo King Ranch is served by Air Ads, Asian Spirit, Pacific Air and Sea Air. Checked baggage allowance is 10kg (22Ib) - extra will be charged for. If you are using Club Paradise/Maricaban Bay Marina Resort, they will meet your flight and transfer you by jeepney to Maricaban Bay or to a 450m (50Oyd) footbridge over a man­grove swamp, followed by a 45mln banca ride to Club Paradise on Dimakya Island. is small. If there are several of you they will drop you at your destination, otherwise you will be dropped in the centre of town, from where you can pick up motorized tricycles. there is no baggage limit or worries about fly­ing after diving. The WG & A Super Ferry 3 leaves from Manila's Pier 4 and takes 12hr, while MBRS Lines leaves from Manila's Pier 8 and takes 14hr. There are also boats from Batangas and Taytay. A quality resort with landscaped gardens and Calamian Deer on a 19ha (47-acre) island. A cheaper branch of Club Paradise, situated on nearby mainland Busuanga and contacted through the same address. Eco-tourism beach resort in Coron Bay, with fascinating wildlife including large monitor lizards around the outbuildings. On the waterfront, with bar, good restaurant. An island just offshore of Coron Town with a full shuttle service at any time. 20 rooms in new buildings on the seafront; the cheapest in town. Bar and excellent restaurant. You would normally eat at the accommoda­tion you are using. Live-aboard dive safaris, PADI courses and Nitrox training. Wreck fanatic Gunter Bernert is one of the original local experts, operating since 1989. PADI courses to Assistant Instructor, TDI Technical diving from Nitrox Diver to Advanced Wreck Diver and diving safaris. PADI courses to Advanced Open Water and PADI Nitrox Diver. An operation of the Philippine Divers Group. PADI courses up to Assistant Instructor and IANTD Nitrox courses. As well as the main Coron dive sites and wrecks, Club Paradise have a number of local dive sites, trips to Apo Reef and one of the best house reefs in the Philippines. Also regular sightings of Dugongs. An operation of the Philippine Divers Group. PADI courses up to Assistant Instructor and IANTD Nitrox courses. An operation of the Philippine Divers Group. PADI courses up to Assistant Instructor and IANTD Nitrox courses. As well as the main Coron dive sites and wrecks, there are a num­ber of local dive sites and trips to Apo Reef. PADI courses up to Advanced Open Water and IANTD Nitrox courses. PADI training up to Divemaster level. Run by Jim Goll one of the oldest operators in Coron Town. PADI courses and diving safaris. A private hospital, considered to be the best. The nearest recompression chamber is in Manila: AFP Medical Center, V. Lunar' Road, Quezon City, Metro Manila; tel 02-9207183. Apart from the area's many islands, beautiful sandy coves and striking limestone rock for­mations, Coron Island has lakes, forests and hot springs. Makinit Hot Springs is one of the best in the Philippines; you can soak in two hot sulphurous pools, then cross 5m (16ft) of beach to cool off in the sea. Lake Abuyok, 110m (360ft) deep, is worth a visit. Coron island also has some Tagbanua - semi nomads of Negrito descent. On Busuanga, the Yulo King Ranch (40,000ha [99,000 acres]) is the largest cat­tle ranch in Southeast Asia. There are waterfalls near Concepcion and, at the northwest of the island, Calauit has a col­lection of African animals plus animals endemic to the Philippines. At Club Paradise on Dimakya Island, Dugongs are regularly spotted feeding on the sea-grasses off the docking area. After the Dugongs settle down, clients are ferried to the site and allowed into the shallow water. WWF-Philippines are studying the Dugongs and the sea-grasses that they feed on here.